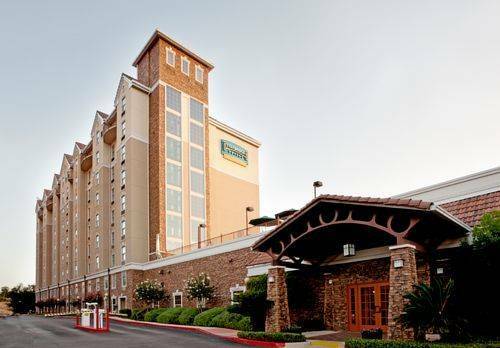 Hotel's Located near San Antonio Airport, North Star MallThis hotel's central location near San Antonio International Airport, top attractions and Ft. Sam Houston makes it a great option for business travelers, vacationers and military personnel alike. Apartment-style suites paired with exceptional service and the comforts of home promise patrons of the Staybridge Suites Hotel San Antonio Airport a pleasant overnight or extended stay.The hotel's location puts San Antonio, TX business travelers about five minutes from Wells Fargo, BBVA Compass and Whataburger Restaurants LP, ensuring hassle-free commutes. Guests are within a 15-minute drive of Henry B. Gonzalez Convention Center. For those seeking event space in San Antonio, Texas, the hotel's 950-sq-ft meeting room and boardroom are a terrific solution.Families planning a weekend getaway or an extended stay opt for this hotel's suites in San Antonio, TX. Near Six Flags Fiesta Texas, SeaWorld and San Antonio Zoo, it's a smart choice. Shoppers also love that North Star Mall is two miles away, and history buffs appreciate the easy drive to The Alamo.We know you'll feel at home in San Antonio, Texas. The hotel's free airport shuttle allows you to focus on more important things, such as the heated, rooftop pool. Free Wi-Fi access keeps you connected, a Fitness Center keeps you fit and a free breakfast bar and BridgeMart keep you satisfied. Book today and prepare to "Get Comfortable!" Clothing, Jewelry, dining. Large indoor shopping mall.